Below are the most frequently asked questions concerning Alabama DUI. While this is not a comprehensive list, we strive to answer the questions we hear on a regular basis. In no way are the answers provided herein applicable to every case, so we encourage you contact a DUI lawyer immersed in the subject matter for information regarding your specific circumstances. We are here to provide advice on your pending charges at this critical time. If you have any questions or concerns not addressed below, please feel free to contact us for answers. Q: Can I go to jail if convicted of DUI? A: YES!! Even for a first conviction, you may be sentenced to serve up to one year in jail (though there is no minimum mandatory sentence). A second conviction (within 5 years) has a range of incarceration from a mandatory minimum of 5 days up to 365 days. A third conviction in a lifetime has a minimum incarceration of 60 days up to 365 days. A fourth or subsequent DUI conviction can result in a minimum of 10 days that must be served, though an offender could be sentenced to anywhere from one year and one day to 10 years in prison. Q: Will I lose my driver’s license if convicted of DUI? A: YES!! For first conviction, you could lose your license for 90 days. This is increased to one year for a second conviction (within 5 years of first), three years for a third conviction, and five years for a fourth or subsequent DUI. 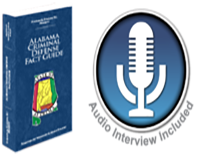 Q: Can out of state DUI convictions be used for sentence enhancement in Alabama? A: YES!! In April of 2006 Governor Riley signed into law legislation that allows out-of-state DUI convictions to be used for sentence enhancement purposes in Alabama. Q: Do DUI convictions still count after five years? A: YES & NO!! DUI convictions stay on your criminal history for a lifetime. Alabama counts DUI convictions over a lifetime for sentence enhancement purposes, with the one exception being if your second DUI conviction is more than five years from your first DUI conviction, the second can be treated as a first conviction for penalty purposes; though, it does go on your record and can count against you in the future. Q: If I am convicted of DUI I can have my record expunged, right? A: WRONG!! There is no provision in Alabama that allows for the expungement of criminal records. If you are convicted of DUI in Alabama, it is on your record for the rest of your life, with few exceptions. The only exceptions are if the court grants you Youthful Offender status and or your case is heard in juvenile court. In both of these cases, your record is sealed and the conviction cannot be later used for sentence enhancement. Q: Every lawyer knows how to handle DUI cases, right? A: WRONG!! Would you go to your family doctor if you needed to have a brain operation? NO! You would go to a doctor that specializes in that field. The same is true for lawyers. Some lawyers practice nothing but criminal defense. Other lawyers take on personal injury cases. etc. Q: There is no way to win a DUI case, so you might as well plead guilty, right? A: WRONG!! In America, you are presumed innocent until proven guilty beyond a reasonable doubt. Many people forget this cornerstone of the American Justice System. Don’t assume your case is hopeless until it has been evaluated by a lawyer immersed in the subject matter of DUI defense. Look at our successful DUI case examples on this website—you might be surprised at the cases we have won. Q: Can I get a hardship driver’s license if my license is suspended for a DUI conviction in Alabama? A: NO!! Alabama has no provision for hardship driver permits; though, your driving privilege may be saved through other ways.